a program that helps students overcome barriers to learning in order that they may achieve, remain in school, and advance. 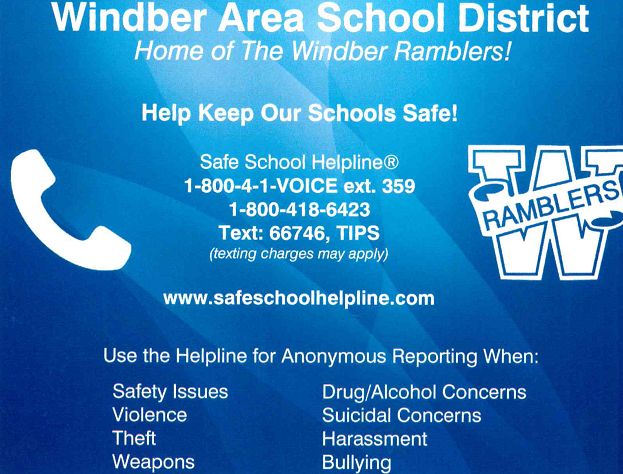 The Windber Area SAP team will help you find services and assistance within your school, and if needed, in the community. We do not diagnose, treat, or refer your child for treatment. We will provide you with information and you make the choice(s) that best fit your needs and wishes. SAP is CONFIDENTIAL and NOT disciplinary. If you know someone who is…..
*Tell an adult ( teacher, counselor, staff member, parent or respected community member) to make the SAP referral. *Confidential referral forms are available in the library. A small group of specially trained and concerned teachers, counselors and community health professionals. How do I know if my friend gets help? You won’t unless he/she tells you…..it’s confidential. Do their parents find out? Will my friend know who referred them? Will my friend get into trouble? No. SAP is there to help. SAP starts the helping process.